Earlier I have write several articles regarding EWS/DG Nursery admission Delhi for the session 2017-18 and some parents ask me to provide everything on single page so that, they don’t have to scroll different pages so here I am with complete information about EWS DG nursery admission Delhi 2017-18 which includes online ews application form, list of documents required for EWS Dg admission, important registration guidelines, age limit for ews admission and much more which is mentioned below accordingly. So keep reading and leave your thoughts in the below box regarding this post. The Directorate of Education “DOE” finally announced the admission date for nursery under ews/dg category in schools of Delhi. The admission is already schedule from 10th of January 2017 and it will be closed on 31st March 2016 all important dates are mentioned below instead of this I have shared the ews dg admission form link below which you can download in Hindi and English as well or also shared how you can apply online. You can download the application form through the official site of “DOE” here: http://edustud.nic.in/mis/studentadmission/webform1.aspx or can download from link given below in the post. Birth certificate under the Birth. Death and Marriage Certificate Act. 1969. Hospital/Auxiliary urse and Midwife. (ANM) register record. Declaration of age of the child by the parents or guardian. Ration card in the name of Parents having name of the Child in Ration card. Domicile certificate of child or his/her parents.. .
Voter I card of any of the parents. Unique Identity Card (Aadhar) of Mother/Father/Child issued by Govt. of India. Proof of Disadvantage Group (DG):-. 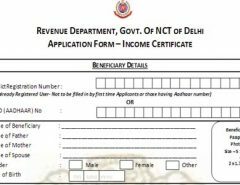 Caste Certificate issued by Revenue Dept. GNCT Delhi (DC Office) in respect of SC/ST/OBC (Non Creamy Layer) ofChildfParents. Medical Certificate issued by Govt. Hospital in respect of child with Special Needs/Disabled .. Documentary evidence for Orphan. (4) Documentary evidence for Transgender . After filling all the mandatory details you will receive the Registration Number & Password. Now back to edudel.nic.in once again click on “EWS / DG Admissions” and click on “Login If Already Registered” fill your registeration ID and password and fill the form accordingly step by step. If still have any question you can ask it me via below comment box and I will try to back you accordingly as fast as possible.